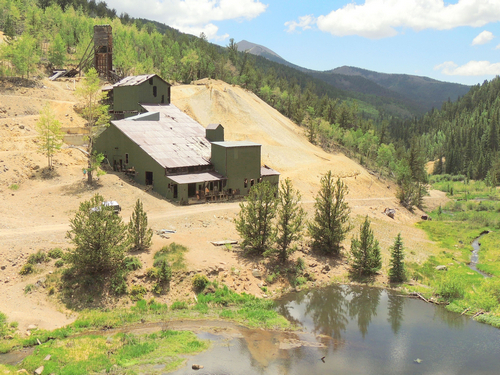 Bonanza has a rich history of mining beginning in 1880 and lasting until the 1930's. Many structures still remain. 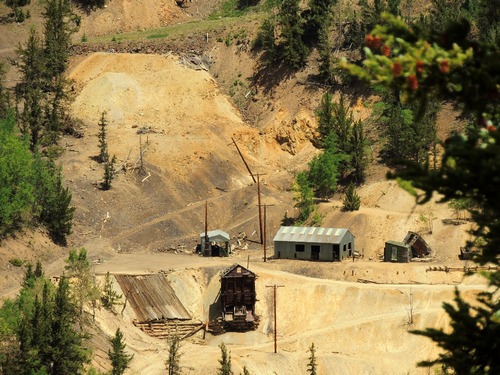 Rich silver ore was discovered in the mountains north of Saguache and west of Villa Grove in 1880, and the town of Bonanza sprang up that fall. The name comes from the optimistically named Bonanza mine; one of the prospectors told his friends, "It’s a Bonanza, boys!" and the name stuck. In 1880-81, 40,000 people passed through the area, including former president and Civil War general U. S. Grant in August of 1880, drawn by rumors that Bonanza was "the new Leadville". 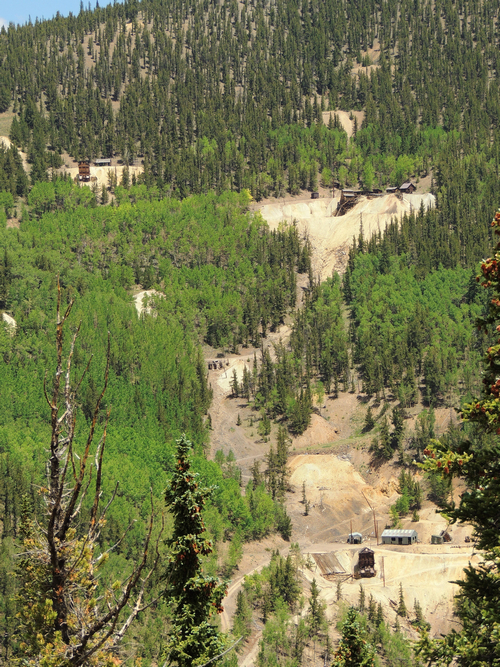 Most of the mines in the Bonanza area closed by the 1930’s. The end of the town of Bonanza almost came in the fire of 1937, when 30 buildings in the business section burned. The town has never been rebuilt, and just a few old houses, mine structures, and piles of rock remain from the boom days. Today, Bonanza is the smallest incorporated town in Colorado with one permanent resident. 2014 article. 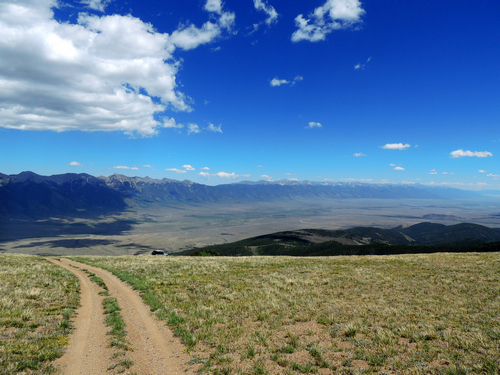 The Saguache Public Lands Field Office has an off-highway Vehicle Tour Map you might find interesting. Also a bit of history. Although there are many Jeep trails in the Bonanza area, this page concentrates on one route that will hit what we consider the highlights of the area. Other roads are shown on the maps, and can be downloaded in the 1A ALL Minor Trails.gpx file if you wish to explore more. See the overview map at the bottom of the page for the first portion of this trip, then look at the detail map. 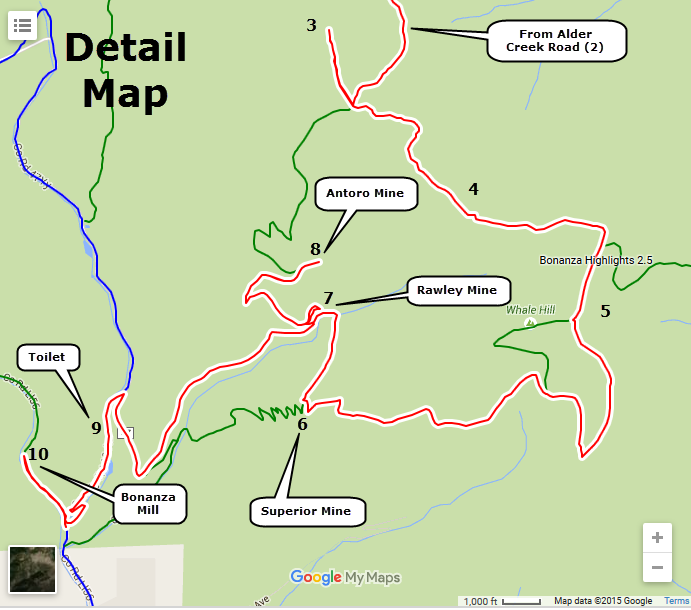 Start on US 285 (1, on overview map) and climb steeply up Alder Creek Road (2), as it is named on the vehicle tour map. 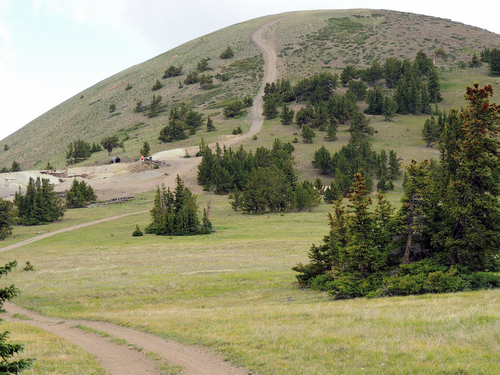 You will pass a couple headframes and a few old cabins, but the first significant area is the open alpine driving up on Round Mountain (photo on right), Mount Manitou and Whale Hill. Round Mountain (3 on Detail Map) could be considered an "extra credit" for a 2.5 rated trail, and can easily be avoided because it is an in-and-out trip. There are 360 degree views at the top, but the climb is steep and a bit loose. This hill is on a short spur to the right after you break out of the trees. Note the old boiler from the Shawmut Mine at the base of the hill. Come down from Round Mountain and follow the track southeast over Mount Manitou (4) and Whale Hill (5). More views in all directions and plenty of opportunities for "Kodak Moments". 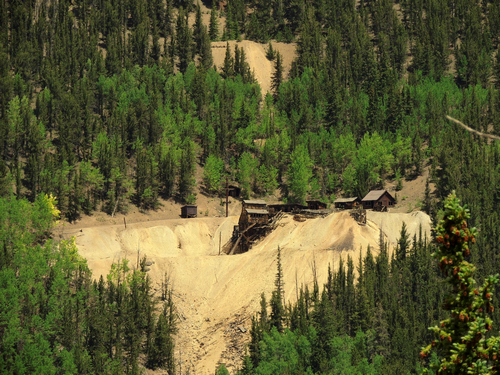 Drop into the trees and continue downhill until you come to the Superior Mine (6), where you make a right turn downhill. Stop at the mine to look over the area you will be visiting next. This is where the first photo on this page was taken. Down the hill and across the creek to visit the Rawley (7) and Antoro (8) Mines. 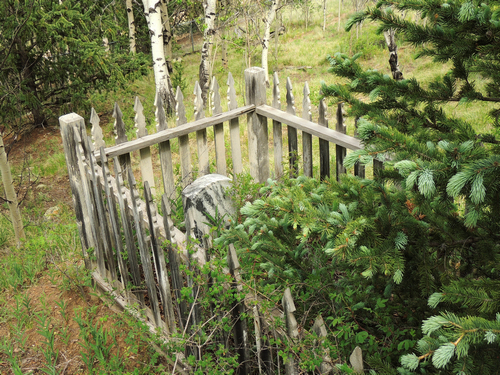 There is a pit toilet and picnic tables (9) along the Bonanza Access Road. 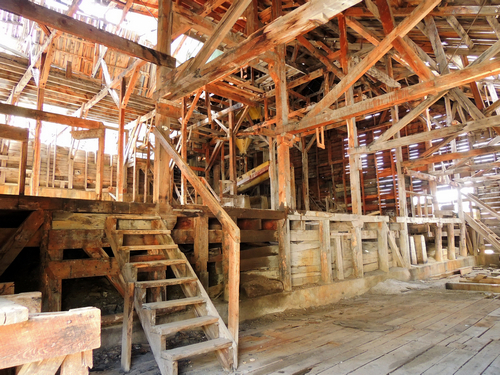 The last stop on this highlight tour is the Bonanza Mill and Mine (10). The mill is an impressive structure. At this point you have several choices, depending on how much time you have left and what you are interested in. Everybody will want to visit what is left of Bonanza. A sign points to the cemetery at the south end of town. This is worth a short visit. If time is short you can simply go south on the County road and head for home. Continue north from Bonanza Mine and do the Kerber Creek loop. 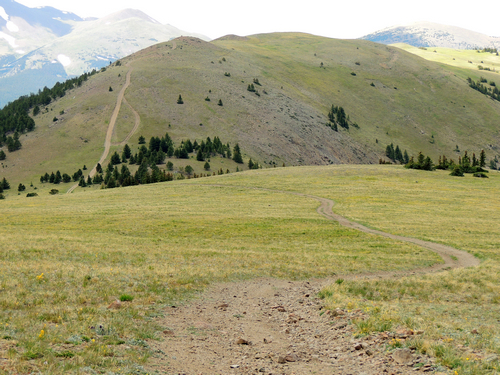 A spur on this loop will take you to small Mosquito Lake. The overall loop has no major attractions, but is fairly scenic. Drop back to the main road and go north on the Otto Mears Toll Road. This is a historical trail, but we do not find it very interesting. It is mostly a narrow road through dense forest with no attractions and very few views. It does open up for a short distance when crossing the height of land, but quickly drops back into the trees. 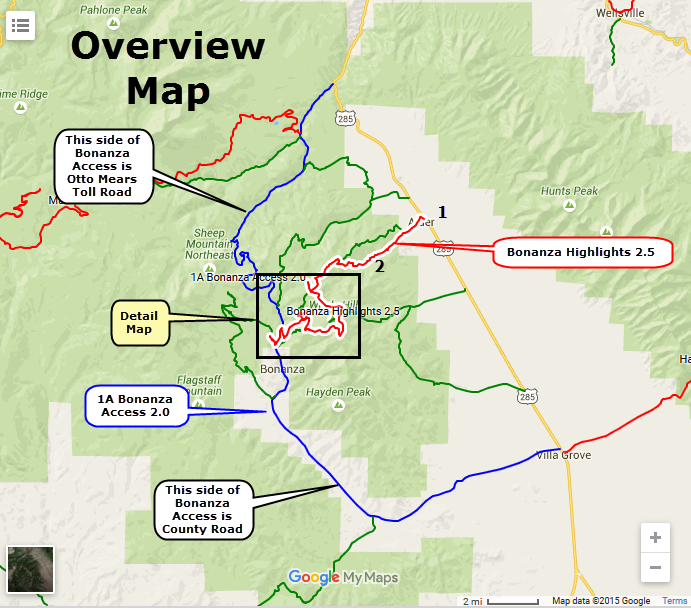 Other roads are shown on the overview map and can be downloaded from the CalTopo map.